Publisher: Rising Star Games. Developer: Spike Chunsoft. 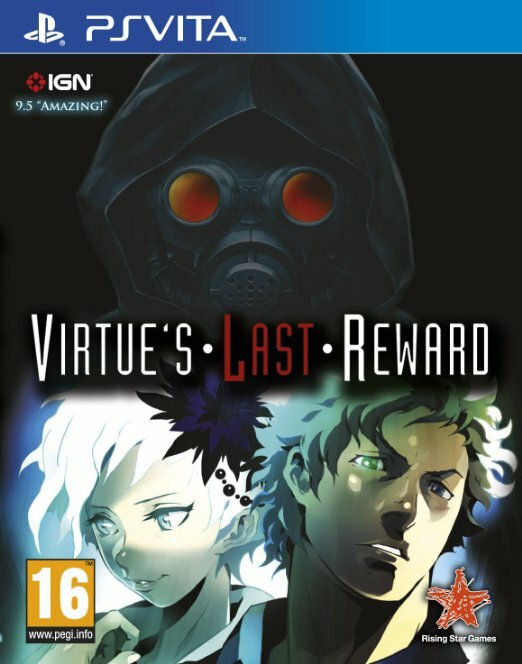 The proposition of a sequel to a US/Japan-only bound DS game might not sound like a tantalising offer, but Virtue’s Last Reward is most definitely a game you should not judge by its cover. A twisty, absorbing adventure with a hefty amount of replay value, Spike Chunsoft have made one of the best games for the Vita, and easily one of the strongest stories of 2012. In other words, anyone with an interest in adventure games should grab VLR instantly. What makes it so good? Well for starters, the absolutely engaging story which anchors the game together. The concept is simple: players take the role of Sigma, who along with eight other participants, are locked in an airtight facility and forced to play a sadistic game by a mysterious figure known only as Zero. Players who have delved into 999 will be familiar with this, as the two share a similar concept. However, one of the key differences is the changes to Bracelets, planted on each character. Now, their colours dictate who they partner with and which puzzle they complete. And, post-puzzle, they must decide if they are going to ally or betray their partner. If both players ally, they both gain two points, but if one person betrays, the other loses points. If a person hits 9 points, they can escape, but if they go below 1, then they die. 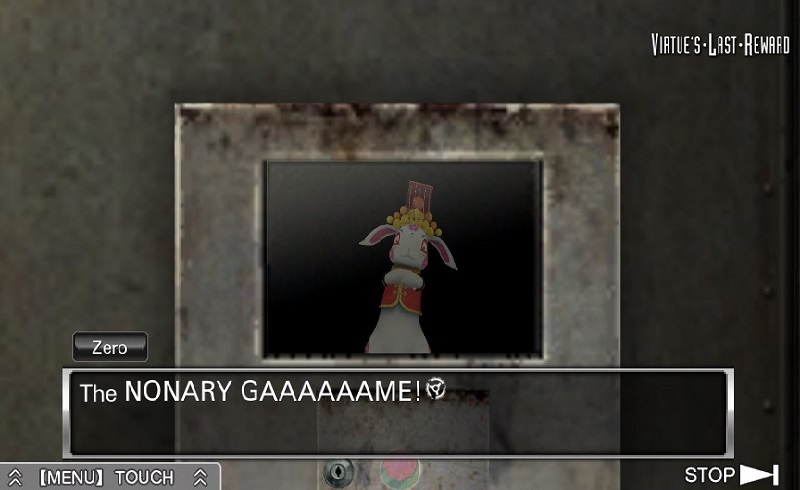 This turns VLR into a crazy-tense game, as you ponder the outcomes of betraying or allying with another participant. You feel the impact of these choices because, despite the limited time you spend with them at first, everyone is fully developed. The first character you meet, Phi, is mysterious, but with a sense of humour too. Once you eventually meet the other participants, they too begin to develop a personality and charm. Dio’s arrogance and brash dialogue is repulsive yet hilarious, Clover remains a mysterious and odd person and everyone else is memorable in their own way. The only sore point is possibly Sigma himself, whose strange sexual innuendos and jokes feel out of place. 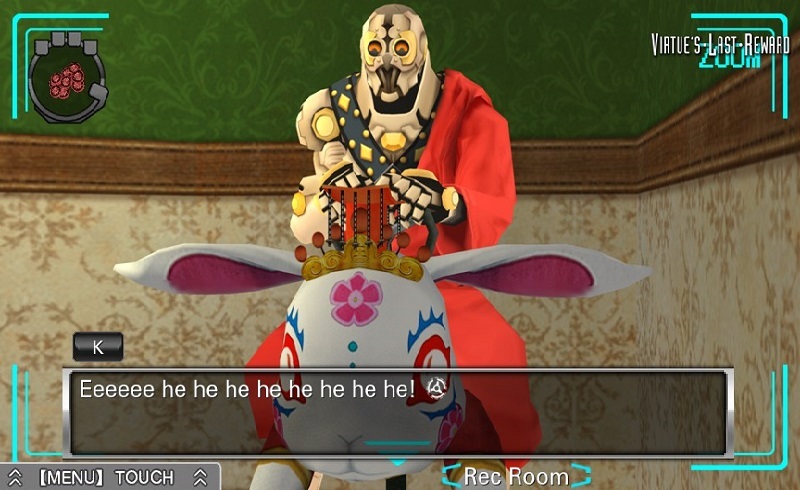 Aside from that, VLR shows how to do character development. Well Thank God we cleared THAT up! 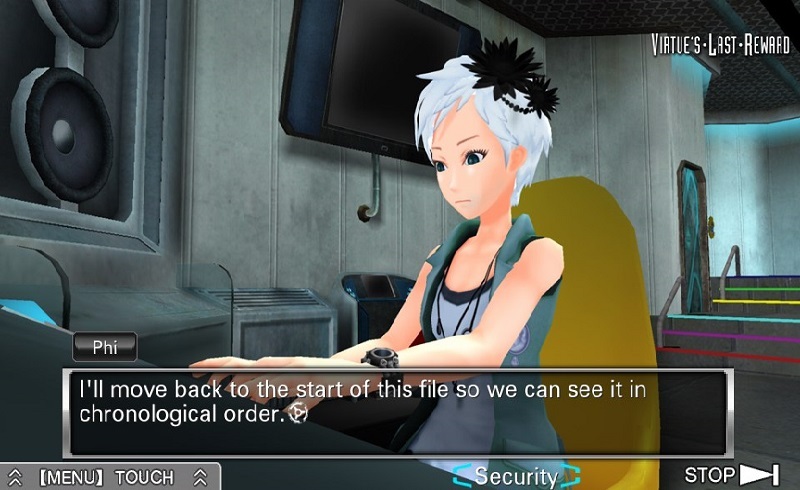 VLR takes the “choose-your-own-adventure” concept and gives it serious depth. Once you finish your first playthrough, which will take a little under ten hours, you then can jump around the game’s events using a tidy, clear timeline. Branching choices are frequent, usually revolving around which doors you decide to enter and who you ally or betray. As you progress, these can lead to one of twenty-two endings, which vary between Good endings, which reveal the backstory of one of the nine participants and are generally upbeat, or a Bad ending, where your actions lead to a negative ending, such as multiple deaths or being unable to escape forever. It is genuinely a joy to seek out all these different endings, and once the final cut-scene is said and done, you will likely have 30+ hours to gameplay under your belt, which is superb. It never becomes a bore during these 30+ hours, though. To avoid repetition, Spike Chunsoft smartly implemented a fast-forward function, meaning you can whiz through cutscenes you have already watched. Meanwhile, the twists and turns you face are a joy to seek out. These are mostly done through Story Locks, which requires you to progress through other playthroughs in order to complete the next section. Why that is a requirement, I certainly won’t spoil, but it’s a pretty well done twist which doesn’t feel forced. 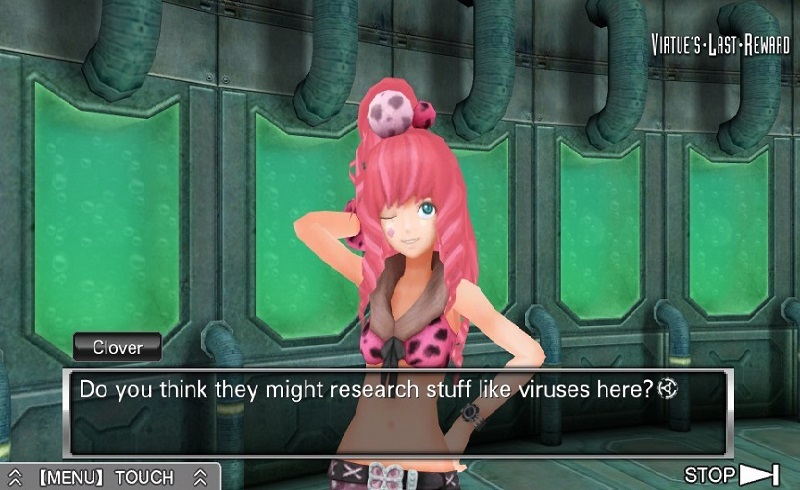 Choice is not the only element to VLR though. Inbetween the lengthy conversations you’ll have, you’ll be tasked with completing challenging puzzle rooms. These mind-bending brain teasers will leave you sometimes perplexed at their sheer complexity, often requiring an intricate series of interactions which border on near impossible to figure out without a bit of luck. The puzzles are certainly challenging, and their cleverness is a positive, but it can also be a little bit frustrating when there’s no clear solution and finding it requires pot-luck. But they break up the story nicely, and with a couple of dozen available, they keep things going nicely. The game benefits from a decent aesthetic as well. 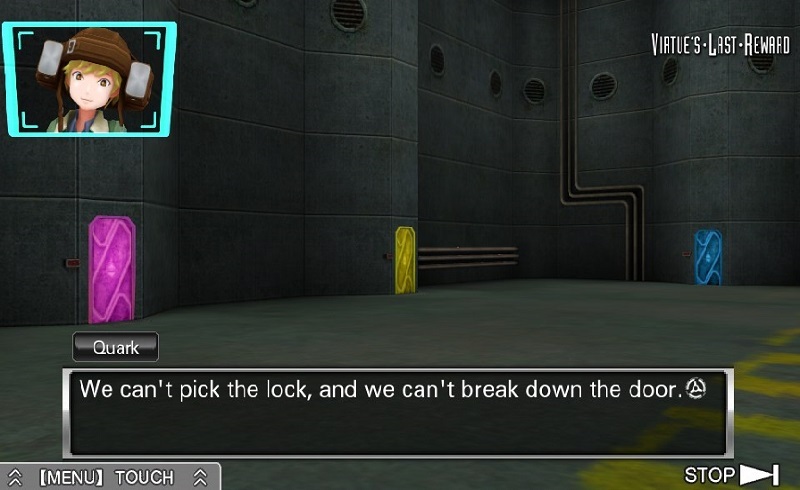 Though not technically impressive, the grimy and dark prisons of VLR feel fitting for the scenario. Characters look pretty decent, and benefit from great dialogue to heighten their personality. It’s a shame the English-voice acting from the US version didn’t make it to PAL territories, but it’s not a massive issue at all. The music, though, is outstanding, often successfully heightening feelings of tension, fear and uncertainty. 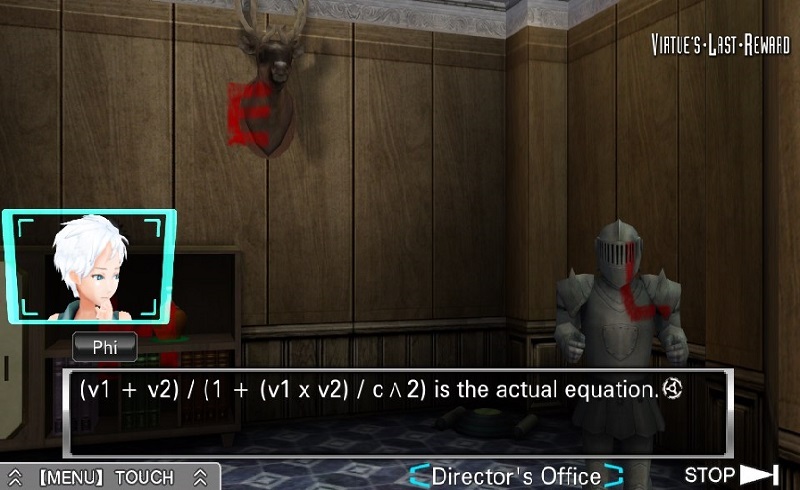 VLR also benefits from smart HUD choices, which make it easier to navigate the game. The Flowchart, documenting all the decision points, is incredibly intuitive to navigate, and other little touches such as a folder to keep track of notes you collect make VLR feel at home on the Vita. In fact, Virtue’s Last Reward is an essential pick-up for Sony’s handheld. It’s a game that feels comfortable in its skin, providing you with a fantastic, twist-filled story that keeps you hooked from start to finish. It makes for great gaming-on-the-go, and though the puzzles can leave you irritatingly stumped at times, they never feel frustrating to the point you want to put the game down. So in essence, if you own a Vita and don’t mind a story-heavy experience that keeps you glued to the screen, there’s no reason you shouldn’t pick up VLR.